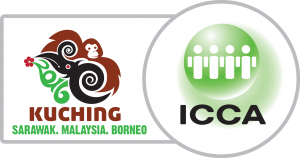 Two weeks ago, I participated to the ICCA world congress in the city of Kuching (in the region of Sarawak, in the island of Borneo, in Malaysia), together with 850 delegates (representing congress & convention bureaus, professional conference organizers, meeting support companies, venues such as congress centers). It was my 6th participation to this ICCA congress as ICCA member. I always like to attend sessions where speakers and moderators have a great connection with the audience. 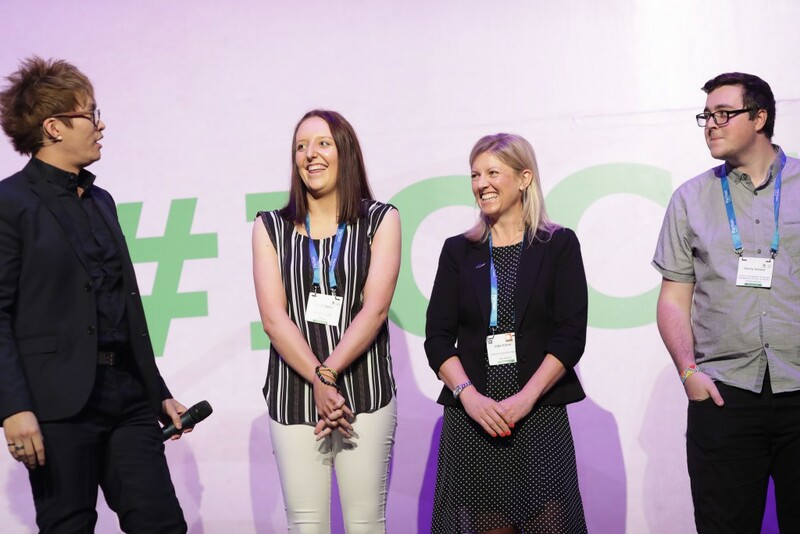 Speaker engagement is key at conferences. Out of the multiple sessions I attended, I thought I would first share with you this one directed by Vinh Giang. Vinh Giang, the speaker and facilitator of this session, happens to be a talented young magician [to make it short: he has built a successful online business that teaches magic to over 41,000 students from all over the world, won South Australian young entrepreneur of the year in 2013; this year, he combined forces with 52Kards which is one of Americas leading online magic schools]. 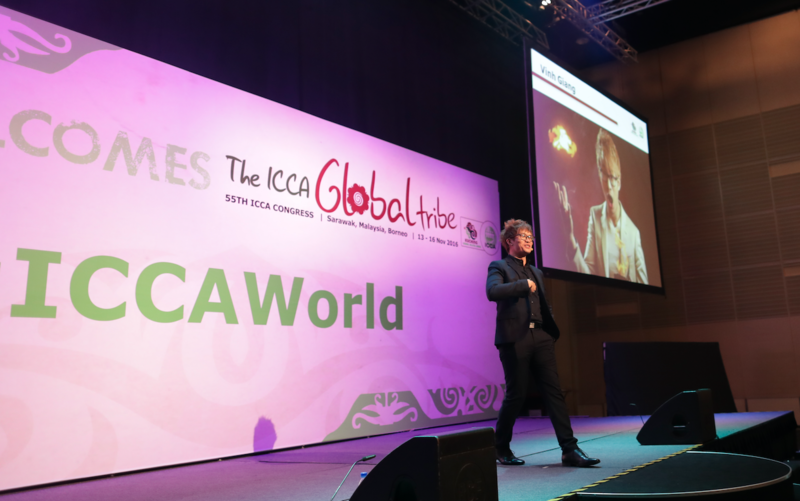 Link with ICCA: Magicians are creating experiences, so do the professional meeting organizers. This person has many talents, this is why I have been impressed and I want to talk to you about his session. And I am not the only one: tweets at ICCA congress refering to him. I will try here to share with you what I learnt. He first appeared at the traditional Monday morning wakeup call for 10 minutes. Showmanship: it is all about enthusiasm and passion. How many time did he practice this trick? 3500 times. Boring? No. It is always the first time for the audience. If you are bored as a speaker, so will be the audience. Element of risk: greater the risk, greater is the experience, greater is the reward. Magic is about living at the edge of our potential, not in our comfort zone. If you never risk, how do you know how far you can actually go? He knows how to connect with an audience and being a magician helps him to get the attention which is key at conferences. He is very humble and this is one of his strengths. He uses magic as his metaphor on stage to explain business principles. Here are a few takeaways from his session. During this afternoon session he covered 2 of his speaking topics: Perspective and Influence. When we follow a magic trick, what usually makes us not seeing the trick is that we only see the problem from one angle. Vinh Giang recommends us to regularly change perspective: to see the problem from a different angle which would make it easier to solve. We therefore need to continuously change view. According to him “Collaboration is power” since other people with other mindsets from us can bring us new points of view. We generally do not see all the opportunities, however by collaborating with other people different from us, this allows to see more opportunities. “Every time there was a problem I couldn’t solve either professionally or personally…I had only started looking at it from my point of view…We also have to look for that different perspective,” Vinh said. “Innovation is just composition. Its two industries or perspectives that have never come together before. Collaboration is power. Perspective is power.” To get a genuine fresh perspective you should speak to someone outside of your industry. More about this part. He then suggested that each time we have a problem, we search for books on Amazon about this problem and get the top three of them, read them, then solve our problem. “We are the direct reflection of the top 5 people we spend time with”. This is the power of influence of the people that are around us. Who are your top 5 ? What is your objective? More about this. And what stops us from doing our dream is very often our own mindset that says “this is impossible”. Our beliefs dictate our actions. We must believe in the conviction that it can be done. One of the solution is about Persistence : staying determined. One step at a time. There would be a lot more to say about Vinh Giang and his thoughts. You can find more about it here. And by the way, one could ask what is the link between Klewel and Vinh Giang. In case you did not get it, he is an international speaker at conferences. And what makes a good speaker is the ability to connect with the audience physically. We are convinced that this strongly helps later on to connect with the on-line audience via on-demand webcast. Thank you Vinh Giang for sharing your knowledge! Hope you found this interesting. Do not hesitate to contact us and to share this post. Yes Mael it was a very good Monday wake up call…. I like his quote…when the speaker or performer is bored, the audience is bored…. You are right, Mkunde, I also like this point. What makes performer outstanding is that they can do 3500 times the same performance with the same passion as if it was the first time and never forgetting that for the audience, this is the first time. This can apply to teachers as well as our personal life. Thank you for your comment!